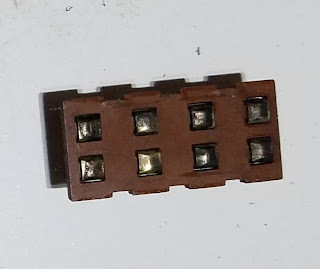 I decided to take off the pre-amplifier board and inspect the tone switches. 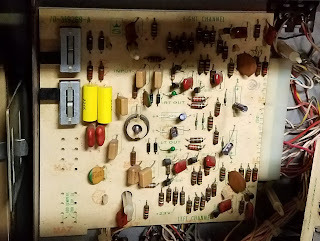 Below is what I found. Also, while I was working on the board I changed out the 2 1.5uF capacitors on the treble switch for .33uF capacitors. All I had in stock was 630volt. 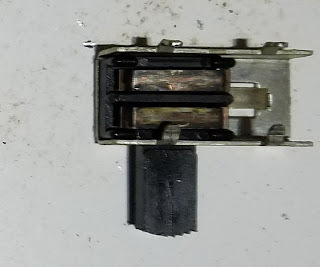 They are over kill for the circuit, but they work. It should work just fine. I will follow up and say that the room your Jukebox is in will also make a difference in tone. 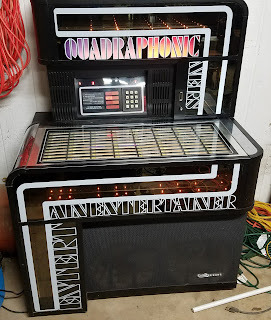 My Seeburg Entertainer is in a large garage with concrete floors and hard walls. If your Jukebox is in a room with more objects to absorb the sound the tone will be different. One last note just for reference. The larger the capacitor in mfd the more high frequency drops. You may need to experiment and find the correct one for your setup.